Grape Hyacinth (Muscari spp. ): growing, planting, caring. Scientific name : Muscari spp. 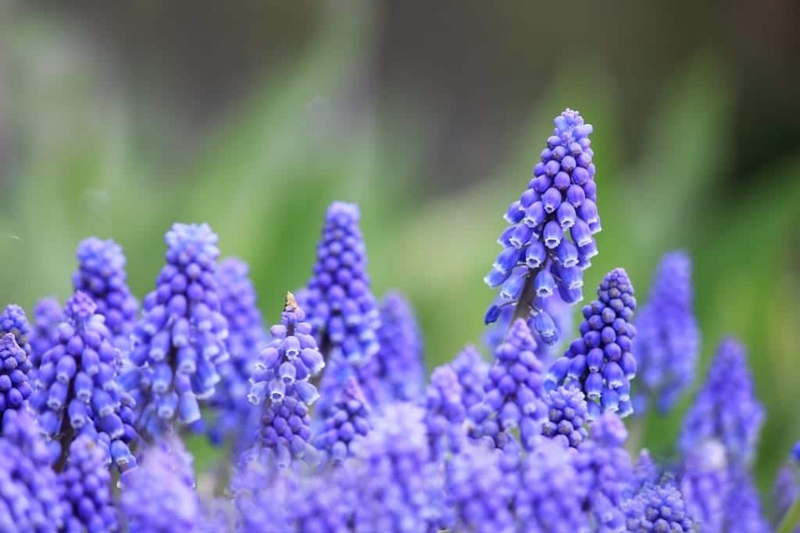 Muscari - grape hyacinth, bluebell or bluebonnet - is a genus of perennial bulbous plants in the family Asparagaceae native to Eurasia, and commonly used as ornemental plants. They produce spikes of dense, most commonly blue, urn-shaped flowers resembling bunches of grapes in the spring. The muscaris are easily recognizable by their blue, violet or blackish flowers, sometimes white, small ovoid bells with narrow aperture, united in a very close cluster, in which they are almost welded. The leaves, long (about 20 cm) and narrow, a little fleshy, of a beautiful green, are located at the base of the plant, and usually appear after the inflorescence. All spring bulbs - and therefore muscaris - can be planted indoors or outdoors. In the garden, arrange them in large groups to form beautiful spots of color - you can also vary the exposures to have spreaded blooming! Plant in the sun or in the shade, in the fall, dig deep, remove all weeds and pebbles and add some peat and sand to the soil. The depth of the hole depends on the size of the bulb you want to plant. The depth must be equal to two and a half times their height. Help yourself with a bulb planter, it is graduated and therefore very useful: push it into the ground to the desired depth, remove it (he takes the earth with him). Then put the bulb at the bottom of the hole, point up. You can put a small layer of sand at the bottom of the hole so that your bulbous plant always has dry feet, and at the same time do not risk leaving a pocket of air that would accumulate water. Finally, cover with earth, by removing the planter which releases the soil which it had carried away. Finish with a good watering. Indoors, in pots or in a planter, plant the bulbs tight against each other for a mass effect. Water regularly for a few weeks. You can easily divide the muscaris tufts, well after flowering, in June or so in September. Separate the bulbs by hand, and give your neighbors and friends extra bulbs! Repot every 3 years in June or September, to divide and to renew the substrate of your muscaris. Separate the bulbs by hand, and replant in a new substrate. Remember to water for a few weeks! If your muscaris do not really like where they are installed, they can develop crown rot. Watch from time to time, and move them as needed.